The Patient Protection and Affordable Care Act (Affordable Care Act or ACA) extends health coverage to millions of uninsured Americans, primarily through newly created Health Insurance Marketplaces and expanded Medicaid eligibility. It also sets the stage for major changes to eligibility determination for both health and human services programs. This paper focuses on using data matches and the coordination and integration of enrollment and retention procedures to improve the efficiency and accuracy of eligibility determination and to increase participation by eligible individuals in health programs and uncapped human services programs. Under the ACA, consumers can generally qualify for health coverage based on attestations made under penalty of perjury. However, when federal or state policy requires further verification, it must be based on data matches, if possible, including information in the records of human services programs. Only when data matches fail to verify eligibility can consumers be asked for documentation. As a crucial step facilitating such data linkages, enhanced federal funding is available for information technology (IT) investments that improve eligibility determination for health programs. Full federal funding is available for state-run Marketplaces, and federal resources can pay 90 percent of the cost to modernize Medicaid eligibility systems. If such investments also benefit human services programs, normal cost-allocation rules are waived, so the latter programs are relieved of the need to share development expenses. This opportunity is time-limited, however. Federal funding for state Marketplace administration stops after December 31, 2014, and both the 90 percent Medicaid match and cost-allocation waiver end a year later. To help state and federal officials who are working to realize the promise of the Affordable Care Act, this paper analyzes possible pairings of health and human services programs for data-based integration and coordination strategies. Researchers at the Urban Institute, working in consultation with federal project officers at the Office of the Assistant Secretary for Planning and Evaluation (ASPE) of the U.S. Department of Health and Human Services (HHS), with input from members of a Technical Working Group, have put together this analysis to identify the human services programs with beneficiary populations that will overlap most significantly with health programs when the Affordable Care Act is fully implemented. We use the term, “human services,” to include a number of programs—EITC, housing subsidies, LIHEAP, and UI—that are sometimes classified outside the boundaries of “human services.” We seek to distinguish the programs that provide health coverage from the programs that meet other basic needs of vulnerable or low-income populations. Rather than rely on administrative data limited to program recipients, our tabulations come from microsimulation techniques that can estimate both recipients and people who qualify for assistance under specified program rules. We use two large microsimulation models: the Transfer Income Model, Version 3 (TRIM3 or TRIM), which is developed and maintained by the Urban Institute, thanks to primary funding from ASPE; and the Health Insurance Policy Simulation Model (HIPSM), also developed and maintained by the Urban Institute with funding from multiple sources.2 We use the resulting combined information to estimate the overlap in (a) populations who will be eligible under the Affordable Care Act for Medicaid, the Children’s Health Insurance Program (CHIP), and subsidies for Marketplace coverage, which are sometimes referred to collectively as “insurance affordability programs;” and (b) people who receive or qualify for the following human services programs: SNAP, TANF, housing subsidies, CCDF, LIHEAP, WIC, UI, and EITC, as well as the noncustodial parents who are potentially reached by child support enforcement programs. We distinguish between recipients and eligibles for all human services programs except UI and EITC, for which we estimate eligibility only. Our analysis is limited to populations under 65, because the ACA’s coverage expansion affects health coverage only for the non-elderly. Both models use the 2011 Current Population Survey-Annual Social and Economic Supplement (CPS-ASEC), which describes household circumstances during calendar year 2010. HIPSM identifies the respondents who have an offer of employer-sponsored insurance defined as “affordable” by the ACA and are thus disqualified from Marketplace subsidies, imputing such estimates based on statistical matches with other sources of information. We import this information into TRIM and combine it with TRIM’s extensive program, demographic, and income information to identify which individuals will qualify for Marketplace subsidies, Medicaid, and CHIP under the Affordable Care Act as well as to estimate human services program eligibility and receipt. Both models take into account current federal and state eligibility rules as well as the new rules for health programs that will apply beginning in 2014 under the ACA. The tabulations are restricted to individuals who are citizens or lawfully present immigrants under age 65. Our estimates show the number of people who will receive or qualify for various combinations of health and human services programs during the average month. Our paper investigates the possibilities for program integration and coordination in states that implement the Medicaid expansion. Accordingly, our microsimulation, which is national in scope, assumes that all states implement the Medicaid expansion to 138 percent3 of the federal poverty level (FPL). In states that do not expand Medicaid, the analysis would be very different. Among other things, the overlaps would be greatly affected by each state's particular pre-ACA eligibility rules for Medicaid. We do not undertake that analysis here. We begin the paper by analyzing data showing how human services programs could benefit from linkages with insurance affordability programs. We then provide results suggesting how health programs could also benefit from linkages with human services programs. Appendices set out a framework for analyzing strategies that link programs to facilitate eligibility determination, enrollment, and retention (Appendix I); a program-by-program comparison of eligibility requirements and methods (Appendix II); a detailed description of our microsimulation methodology (Appendix III); additional microsimulation results (Appendix IV); and a list of experts consulted in the preparation of this report (Appendix V). 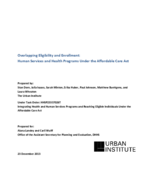 This paper is part of a larger study— Integrating Health and Human Services Programs and Reaching Eligible Individuals Under the Affordable Care Act—with later stages that will build on the analysis presented here.